On February 25, Chokwe Lumumba, the mayor of Jackson, Miss., died suddenly, reportedly of a heart attack. He was 66 years old. In the 1960s, Lumumba co-founded the Malcolm X Grassroots Movement, a black nationalist organization that advocated for reparations and for the creation of a separate republic with a “predominantly black government” in the southeastern states. A prominent civil rights attorney, Lumumba once helped rapper Tupac Shakur clear himself of aggravated assault charges, and as a member of the Jackson Human Rights Coalition he pressed Mississippi for a retrial in the murder case of Medgar Evers, the NAACP’s first field officer in the state. 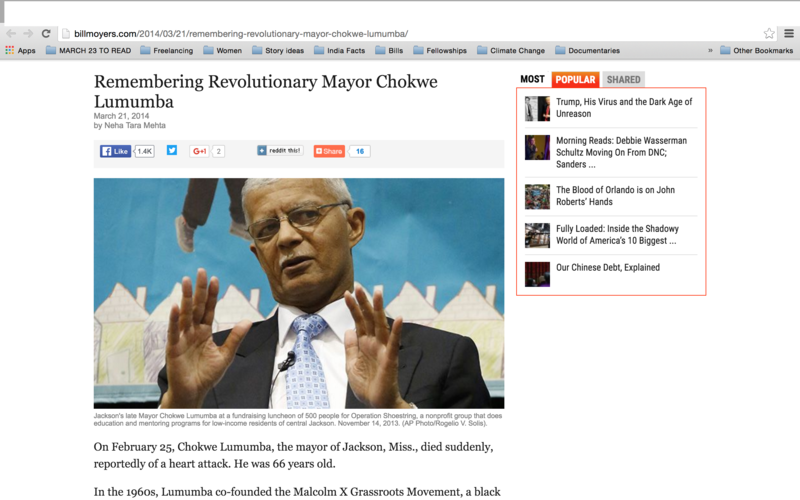 According to The New York Times, Lumumba was a respected civic leader who ran for city council in 2009 and was “urged by neighbors and politicians” to run for mayor last year. He won with 87 percent of the vote. His Times obituary notes that political office didn’t temper his revolutionary views. Just two weeks before he died, he spoke with Laura Flanders of GRITtv about his vision of “solidarity economics” for a YES! Magazine series on strong local economies. He believed that economic development and the creation of jobs must be a collective rather than individual effort. “The role of solidarity economics is central because it is the economic transition from what is to what must be,” he told Flanders. Change does not come on thoughts alone; because we have a revolutionary ideology and give speeches on it. It comes because you can change the material conditions of people, and get people to assist in the change, be the mainstay in the change in their conditions. And so, how do we achieve that, that’s the real challenge for us. We don’t think we can do it in the way we did it in the ’60s and ’70s. We raised up millions of people in fiery speeches and that was good — I’m in love with that period — but at the same time, the people been suffering for a while and fiery speeches are not going to do it. We’ve got to tell them how we’re going to fix their streets; how we’re going to feed them, how are they going to eat, where are they going to live. How are they going to avoid being in a neighborhood which goes unattended for so long that it becomes a target for urban renewal which is really just urban removal and then they lose their homes and they turn around and they’ve got condominiums there and they can’t afford to buy a condo and then they’re shuffled out to the outskirts of the city where once again, they find themselves in another community of poverty, or even in a community of poverty outside the city.